2 teaspoons fresh rosemary, finely chopped, about 2 sprigs. Easily remove the rosemary from the twig by pushing them down with your fingers in the opposite direction. Combine peppercorns, rosemary, thyme, sage and salt in a small bowl. In a large skillet heat 1 teaspoon oil to medium. Add garlic saute for 1 to 2 minutes. Add spinach and saute until just wilted. Remove from heat. Spread half of the herb mixture on one side of the beef. Then spread spinach mixture closer to the end where you will begin the roll. Top the spinach with some crumbled feta. Roll the beef snug, and tie it, one string across the length and 4 or 5 strings across the width. Sear the meat: Heat oil to medium high in a stainless steel skillet. Place your beef into the hot skillet and sear until it is brown all around. Spread the remaining herb mixture over the beef and place into a roasting pan. Roast 10 minutes in the oven. 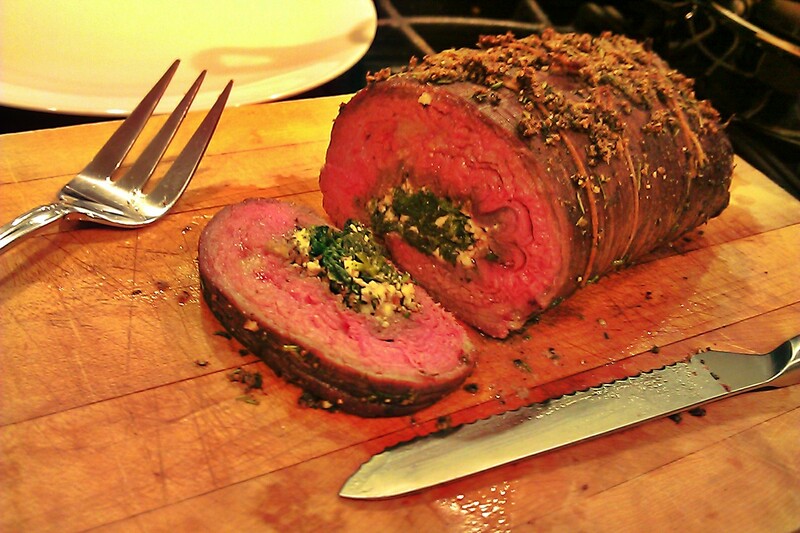 Reduce oven temperature to 350°F and roast 16 minutes longer for medium rare, 20 minutes for medium. Transfer to a cutting board and let rest for 10 minutes. Should make at least 12 slices, if not more. I’ve made similar fillings/stuffings, but never included spinach. That’s a brilliant idea! Wow, this looks delicious. Wouldn’t have thought to do this with beef so I might have to give it a try! Works really well with a good cut of beef. Thanks! What a delicious looking roast…cooked perfectly, I might add. Very well done! I must try this myself. oh YUM. I’ve been meaning to do a roast like this in ages. Any tips on keeping the meat moist and juicy? Searing the meat on high heat so that it only browns the outside will keep the juices in when you cook it. For my first roast I had to slice it to see how well it was cooking then put it back in the oven to cook longer. Once I got the timing right I write the time it took for medium-rare and medium. Also certain cuts are juicier than others. I found flank steak to be quite tender and juicy. Tri-tip not so much. If you cook tri-tip to barely medium it will already be quite tough. I guess I must be feeling better after my little bout with “whatever it was” but this is looking sooo good to me right now. I’m not sure if it’s so great getting my appetite back when I don’t have anything in the house though. You know you’re feeling better when your appetite comes back – that’s for sure – especially if you’re craving steak! I never seem to have anything in the house. I’m at the grocery almost daily. The staff at the grocery have practically seen my son grow into a toddler.